Changhua cornelian stone, the unipue precious stone in China, shiny red, spardling, and crystalclear, same treasured asjewels and jadeite by pelple through ages, is renowned as one of China national treasures. It is produced in Yuyan Mountain, the source of West Zhejiang tourist grand canyon, Lin'an, Zhejiang, where used to be called Changhua, hence its name Changhua cornelian stone. 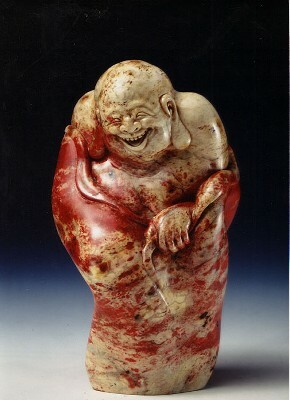 Changhua white jade based cornelian sculpture, carved by Mr. Yang LiuHai.